Nationally recognized stock market investing pro, and supplier of investment forecasts to major Wall street financial outlets, is predicting a major stock market decline. Recognized stock market investing analyst and market timing guru Woody Dorsey, whose research is provided to some of the world’s leading investors, says the stock markets are headed for a “Black Hole”. In the past, Dorsey’s investment forecasts have been extremely accurate and help to explain why his research has been featured in Time, BusinessWeek, The Wall Street Journal, Barron’s, USA Today and many others. “Please try not to think about “the market”. Financial culture is single-mindedly obsessed with, the “why” of every market move. But, the facts of behavioral science have proven that, “rationality,” is not very useful. You are going to hear a lot of talking heads talk ardently explaining the market to you, which is not really useful. It is a misdirection; corrections happen as a consequence of mood shifts and the recognition of uncertainty,” stated Dorsey. Should Investors be Scared of a Black Hole? “Should you be upset by the black hole? No, corrections are nothing to be scared of. They are normal and lawful aspects in the life of capital markets. I am not predicting the end of the world. Such a dire prediction will always be a low probability event. But for anyone who is invested in the market, “wonderful corrections,” like the one that is coming, are important and it is most important to understand when they may occur. Black holes eventually resolve into buying opportunities,” says Dorsey who publishes a weekly sentiment timing newsletter. “Every black hole which I have forecast has been an investment opportunity. Don’t expect the pundits to understand this. They rationalize everything. They are explaining that the market is just about, “Brexit.” But, eventually, extreme negative psychology produces extreme low sentiment and a coincident price capitulation. That behavior is a “black hole.” That is when it becomes a buy! Expect the pundits to rationalize why there is no good reason to buy when the market is actually bottoming,” Dorsey continued. “My indications are for a “wonderful decline.” The black hole environment is not really here yet. So, don’t expect a low right now. The recent market failure, nominally due to Brexit, is only the beginning of the correction. Brexit was only a metaphor for market uncertainty. Equities have been telegraphing structural vulnerability for months. 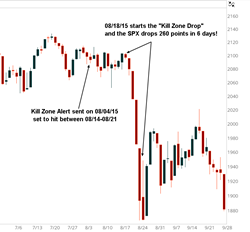 I will be writing more about the timing of the stock market low as the black hole approaches. All you really need to know is that I expected it, it is happening and it is far from over. The black hole environment continues to act as a negative price magnet. Enjoy the ride.” Dorsey concluded. Get the next reversal date and additional information from Woody's website. Woody offers research and insights to global investors. His independent research, with a focus in Behavioral Finance, is provided to some of the world’s leading investors. His research has been featured in Time, BusinessWeek, The Wall Street Journal, Barron’s, USA Today and many others.